It’s way too-early-o’clock on a chilly December morning in Crystal River, Florida. The weak winter sun has barely peeked above the horizon. Banks of wispy mist hover over the cypress-brown water around our boat. Everyone is quiet, subdued. Sleepy. We anchor in a shallow area and I slip carefully into the water. Fins and mask on, I go in search of my favorite, fattest sea-going mammal. I don’t have to look hard, or at all, in fact. A nose breaks the surface, then disappears. There they are, beneath me, parked up in the river like RVs at an underwater camp site. They sleep on the white sand of the bottom, and only need to bob to the surface for air every half an hour or so. This is their refuge, from the cold of the ocean, and from their only known predator: homo sapiens. The Crystal River stays a constant 70F all year round, fed by springs which pump tens of thousands of gallons of pure, fresh water into it every day. Winter is the best time to see them in large numbers, as during the hot months they roam the coast. Their other major risk factor is boat strikes, and this stretch of the river is subject to speed restrictions. Many of the adult manatees around me have the deep, white scars of propeller cuts across their backs. How anyone could hurt these peaceful, gentle herbivores is completely beyond me. They draw me to this place again and again, although I live 3000 miles away in England. I grew up in Florida, but I only discovered their magic when I had been away for more than 20 years, once they gained protected species status and became a tourist attraction. The sun gets a little stronger. Some of the behemoths start to stir. They are inquisitive and playful, especially the calves, who weigh in at about 500lb (compared to their 2000-lb mamas). Distant relatives of the elephant, I find their whiskered faces goofily beautiful. A calf approaches my outstretched hand, which is the signal that he wants to interact. They especially love to be scratched under their flippers, and I’m more than happy to oblige. He shows his delight by rolling over an d over for me. We are in the secret Three Sisters spring, which looks like it was designed by Disney: blue water, pure white sandy bottom, all encircled by towering cypresses draped with Spanish moss. The sun sparkles now. My little friend bumps my arm. He wants more scratching. I look into his round cartoon eye and feel totally, utterly at peace. After a morning of this, I am centered, calm and happy. 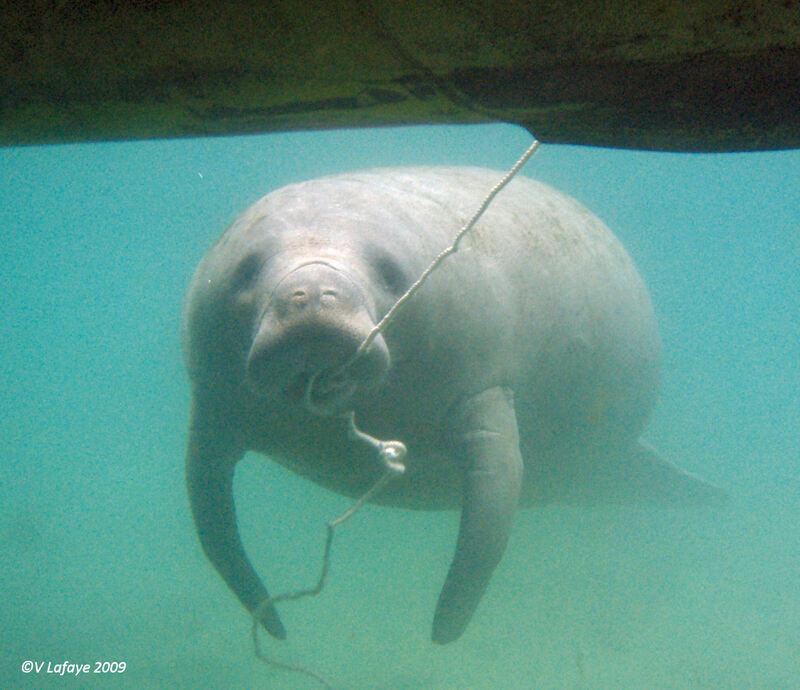 Manatees were hunted as late as the 1940s, when meat was scarce. This is just one of the facts that I discovered when I started researching Florida’s history for ‘Under a Dark Summer Sky’. The research led me into some very dark corners of my home state’s past. I will keep coming back, every year if I can, to swim with its sweetest, most docile and endearing resident. You’re analogy is awesome… “parked up like RVs in a winter campground” Love that! So glad you got to spend some time with the manatees. Fantastic photos! Thank you! I’ve done it every year for about 8 years. It’s my mental health day!